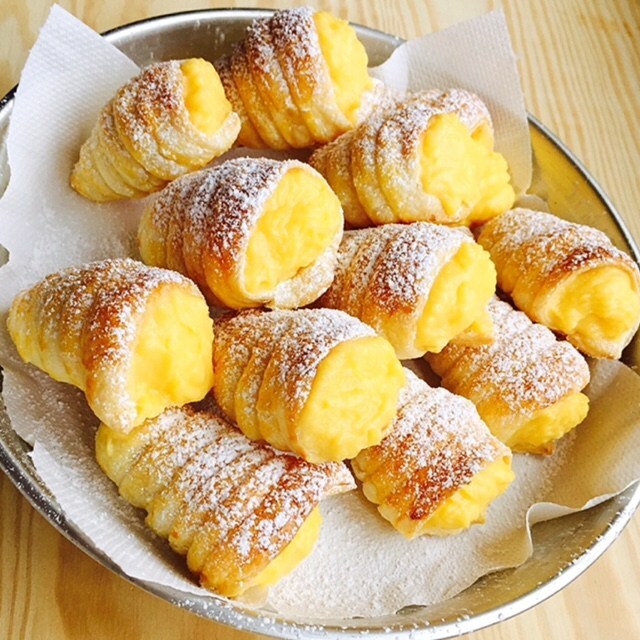 There is an Italian pastry called “cannoncini”, which means “little cannons”. 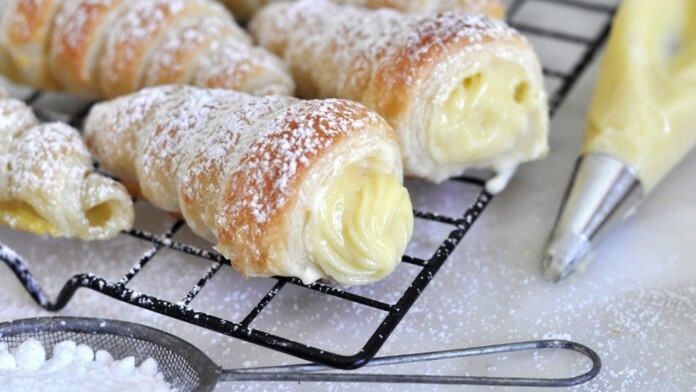 These are a bit like cannoli, but filled with pastry cream instead of ricotta cheese. Cannoncini are very similar to cream sticks. First, pour the milk in a pot along with the heavy cream, the peels of 1 lemon and the vanilla extract. Place the pot over medium heat until the liquid reaches 165°-170° F, then turn off the flame and cover with a lid. Then, whisk the yolks along with the sugar until pale yellow and fluffy, then add the cornstarch a tbsp at a time and keep whisking until well consistent. At this point add the hot milk and cream infuse(discarding the lemon peels) and continue whisking. Finally, pour the mixture again into the pot and place over medium heat: keep wishing until thick(about 5 minutes). Once ready, pour the pastry cream in a bowl and cover with plastic wrap until reaches room temperature, then store into the fridge up to 48 hours. The critical problem using pastry dough sheets is keeping them cold: otherwise, the dough will start to lose consistency. So, you want to work quickly and possibly store the pastry 3 minutes into the freezer when necessary. First, crack 1 egg in a bowl and wish until consistent. Then, pour the sugar into another bowl… Now, roll down the pastry dough sheet 9×9 inches per side on a wooden board. Then, reduce the sheet into 12 ribbons. After that, Brush the strips with the beaten egg, just a thin film. Once baked, let the Cannoncini cool down 10 minutes, then remove the molds twisting and pulling very gently. Store the Cannoncini horns into a box up to 2 days, then fill them just before serving. 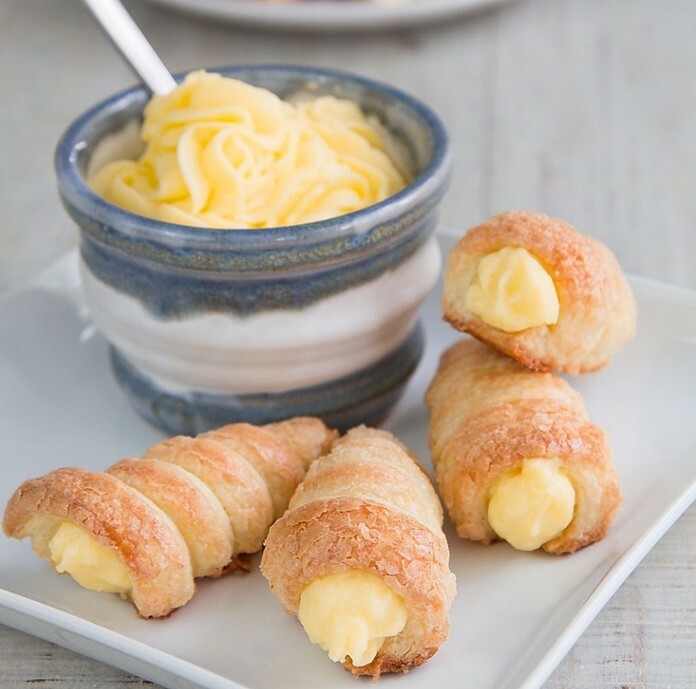 Pour the cream into a pastry bag then fill the Cannoncini, and serve immediately!